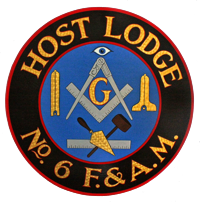 History of Hobart (now Host) Masonic Center – Host Lodge #6 F. & A.M.
We purchased the land — 4 lots — from Cy Fox, in what was known as the Steinhauer development, on the corner of Dennis Ave, and Ridge Road. We built the first floor pretty quickly, from the funds we had accumulated and prided ourselves that everything was paid for as we went! We were able to purchase most materials at cost from the business people in our craft: lumber from Cyrus R. Fox, mason materials from C.K. Hoffman, electrical materials from Joe Hoffman who, along with his 2 sons, did all the installation at no cost, plumbing materials from Leroy Clayton who also performed all installation free-of-charge. Once the first floor was ready (except for the kitchen) we began holding our famous and delicious Sunday steak dinners, organized by George & Edna Cregar and Irv & Doris Schuetz. Steaks were grilled to order on an outdoor barbeque pit, and the diners sat at plywood tables supported by saw horses, sitting on plank wood benches resting on cinder blocks! The kitchen crew washed the dished outdoors at a make-shift sink, and many, many hours were spent on this effort. Of course, Irv’s 50/50 raffles continued to be another major source of funds, as well as the many rummage sales held in the new building. In fact, the garage door was installed originally to provide easier access for rummage items such as used furniture, etc. Steak dinners continued to be a major fundraiser for the next 5 years. During the fall of 1962 we hit a snag. The Grand Lodge determined that our fundraising projects were not in accordance with their regulations. WB Ken Perry, then Worshipful Master, myself as Senior Warden and other elected officers of our lodge, were summoned to meet with MW Grand Master Claude Van Stone in Newark. We were ordered to bring our charter. Worried and concerned, after the tremendous effort we had made, we went to Newark. The problem was that our fundraising had involved the public. At that time, Grand Lodge regulations did not permit public solicitation of funds for any purpose. We agreed to discontinue any fundraising involving the public and returned home, charter intact !! We had to change our tactics for funding the remainder of the construction so we obtained a mortgage from a local bank and continued. We burned the mortgage a short ten years or so later. With this obstacle overcome, we tackled the construction of the lodge room and completion of the building. This was accomplished by July 1, 1963, which gave us the summer months for moving in. This was a tremendous task considering the many steps at the old building, the theater seats, furniture, desks, columns, and the rough and smooth ashlars which each weigh over 100 pounds. But we were all moved in and able to hold our first meeitng of September 1963 in our new lodge room. I had the honor of being the first Worshipful Master to preside in the new building. The Worthy Matron of Hobart Chapter was Josephine Bonham. In due time we applied for, and received permission from the Grand Lodge, to hold our cornerstone laying ceremony. This was conducted in June 1964 by MW Roland R. Berins, Grand Master, and the entire Grand Lodge staff. WB Richard Albrecht, then Worshipful Master, provided and cut the cornerstone, and I myself constructed the soldered copper box to hold the contents, which included such items as: the membership lists of Hobart Lodge and Hobart Chapter, the by-laws and trestleboard of Hobart Lodge, the calendar for Hobart Chapter, a copy of the program for the cornerstone laying ceremony and photos of the construction of the building in its various phases. As you can see by this history, many, many members and friends contributed to the energetic project of erecting Hobart Masonic Temple. We are all proud of this facility, built by our own hands, which have served us well for almost five decades, and hopefully will service our organizations for many more decades to come.